For nearly 10 years now, our university has hosted several prominent black poets and other African American cultural figures. In many respects, African American literature at SIUE, and in particular, my faculty mentor Eugene B. Redmond orchestrated visits for many of the artists. 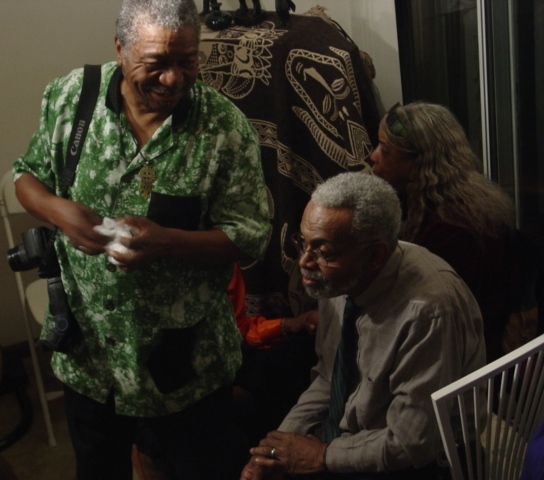 Between 2003 when I first arrived and 2007 before Redmond's retirement, I assisted him in organizing a few "black arts" symposiums that featured readings and presentations by Amiri Baraka, Jayne Cortez, Haki Madhubuti, Quincy Troupe, Sonia Sanchez, and the late Katherine Dunham. In 2009, the university's Arts and Issues program hosted Maya Angelou and then two nights ago, the program hosted Nikki Giovanni. In both cases, the interests of African American literature at SIUE helped influence the decisions to bring Giovanni and Angelou to campus. Demonstrating that we had a history of bringing prominent poets, especially those linked to the Black Arts era of the 1960s and 1970s, was crucial in encouraging the university officials to move forward with featuring these figures. Redmond made it possible for me to meet and interact with each of the poets and artists for extended periods during their time on campus. He had established decades-long friendships with each of the figures prior to their visits on campus, so my meetings with them went much smoother than I could have managed on my own. By the time I met Sanchez, Cortez, Madhubuti, Troupe, and then Angelou, for instance, Redmond had already shared with them who I was, so I was positioned to have even more in-depth talks with them. What made the Giovanni visit especially important for me was that I got the chance to introduce her to a group of my students in a small setting before her formal presentation. In many respects, I was attempting to follow in the footsteps of Redmond by linking prominent visiting poets to our folks at SIUE.